These pancakes are just shy of 90% whole-grain; and they're absolutely delicious, featuring the sweet-nutty taste of oats and wheat. 4 mins. to 8 mins. Put the flours, oats, and all other dry ingredients into a mixer with a paddle. Mix on slow speed, and drizzle the vegetable oil into the bowl slowly while the mixer is running. To make pancakes: Whisk together 1 cup of mix, 1 cup of buttermilk (or a combination of half plain yogurt and half milk; or 3/4 cup liquid whey), and 1 large egg. Don't worry if it seems thin at first: the oats will soak up the milk, and the mix will thicken a bit as it stands. Let the batter stand for at least 20 minutes before cooking. Heat a lightly greased griddle to 350°F (if you've got a griddle with a temperature setting; if not, medium-hot will do). Drop the batter onto it in 1/4-cupfuls (a jumbo cookie scoop works well here) to make a 4" diameter pancake. If you have English muffin rings, use them; they make a perfectly round, evenly thick pancake. Serve pancakes immediately, or stack and hold in a warm oven. 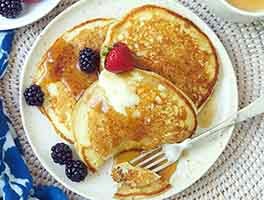 Buttermilk powder: Add 1/4 cup buttermilk powder to the 1 cup of dry mix along with 1 large egg and 1 cup water or milk. Yogurt: Substitute Greek-style or standard plain yogurt for the buttermilk, thinning batter to the desired consistency as necessary. Dairy milk or plant-based milk: Mix 1 tablespoon white or apple cider vinegar, or lemon juice, with enough milk to measure 1 cup; mix thoroughly and let rest for 5 minutes before using. Counting fat grams? Reduce the vegetable oil in the mix from 1 cup to 3/4 cup; the resulting pancakes will be slightly less tender. If you're afraid your family might object to the mild "grainy" flavor of these pancakes, add 1 tablespoon orange juice to the 1 cup dry mix along with the buttermilk. We've found that the acidity and sweetness of orange juice helps mellow the tannic taste some people perceive in whole wheat flour. While the pancakes won't have any orange flavor, they may taste slightly milder to you and your family. 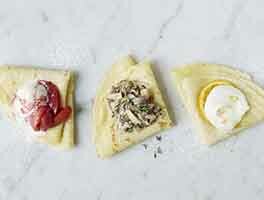 To keep pancakes warm prior to serving, place them on a baking sheet and tent with foil. Keep warm in a low (200°F) oven for up to half an hour. Want to make a quick fruit sauce to go with your pancakes? Check out our easy microwave jam; instead of refrigerating the thin jam once it's cooked, serve it immediately, as sauce, with pancakes. These pancakes are very amenable to mix-ins. A partial list of combinations that have made successful appearances so far: peach, raspberry, banana-walnut, cheddar-apple, blueberry, and cranberry-apricot. I made the mix with butter instead of oil and opted out of the sugar since maple syrup has plenty of sweetness! I've used this recipe a variety of ways. I've made batches with almond milk, butter milk and milk all have turned out perfect! I make these all the time for family and guests and every people who don't like pancakes love them. My only caveat is to use only real buttermilk in the recipe because the texture is the best of all other options. I add frozen blueberries to the batter. Halved this recipe just in case the family didn't like. They were great. Whole grain and still fluffy and light in texture. I did add the orange juice and maybe a little more than necessary since I had cut this recipe in half. I had some great wild blueberry syrup that I had been waiting to use on a pancake more deserving than the average and this one hit the spot. Love that I had some left for the refrigerator for next weekend's big home made breakfast. This recipe could not have come via e-mail on a better day. My small town in northwest Ohio is snowed in. 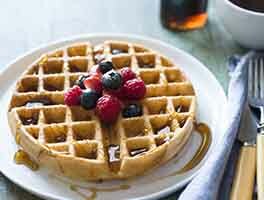 I had just made your whole wheat waffles the day before, and thought I would try the whole grain mix and see how they differ. The addition of rolled oats in the whole grain mix is a great one. 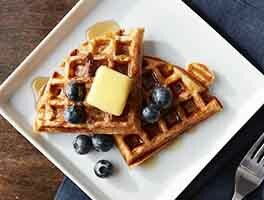 It gives the waffles or pancakes a nutty flavor and texture. The mix went together quickly, so I now have some in the freezer for future use. I froze the mix in one-cup measures in small plastic ziplock bags. I always have buttermilk on hand, so mixing pancakes or waffles will now be a breeze. These pancakes turned out beautifully! 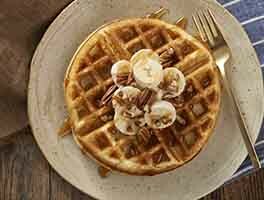 My husband and I gobbled them up and spoke in between forkfuls about the ease of using this homemade mix on weekday mornings for a quick and much more delicious alternative to store-bough frozen waffles. Griddle needs to be well-seasoned for following the recipe's direction of only lightly greasing it. Also, I suggest using Oxo Good Grips Flexible Turner to flip the pancakes, since this is a bit of a softer batter. I've hated pancakes since I was a child (50 some years now). When my parents came to live with me so I could care for them, I knew that pancakes were one of their favorite things to eat. I searched KAF (my go-to for any recipe) and found this. I kept a big batch of mix in the fridge and we all loved these for dinner. Now the folks are gone, but I still love these pancakes! When I fix them now I remember our happy times around the table. YUM! Made 3 batches of pancakes this morning and we ate them all! Very good. I did cut the 3rd cup of buttermilk to 3/4 cup, otherwise made as directed. Think we actually got around 28 pancakes and didn't use all of the mixed batter. I have used my Gramma's recipe for years and no other recipe has compared, except this one. I've been making this mix for years now. I keep a storage container of it in my fridge to use whenever we get the urge for pancakes. My four year old grandson asks to come over for breakfast on the weekends just so he can have them. He likes to add cut up strawberries to them. We've added blueberries and chocolate chips too. It's the best recipe! I love King Arthur flour! I made up the mix on Friday and then made pancakes both Saturday and Sunday as requested by my son. I thought the recipe was very tasty, but the first time I made them the batter was way too runny. I had let them sit for 20 minutes as directed, but it never thickened up enough for my liking. The next time I used 3/4 cup milk to 1 cup mix, as well as 1/4 cup buttermilk powder and I thought the consistency was perfect. I do like having a mix ready to go! Next time I think I will add cinnamon and/or vanilla as I see other people have done. I might also try add in a banana. Lots of potential for customization!